At Christmas, my sister-in-law expressed interest in having seasonal wall hangings for her front door. I had given her a very cute snowman, which was a pattern from a quilting magazine. As a challenge to myself, I decided to try my hand at designing. I have already completed a design for Valentine's Day, so I moved on to Easter. Spring is so close and I had a lot of fun playing with pastels for a change! I really wanted the bunny to look like the quintessential Easter candy, Peeps. It has been a loooong time since my last post on this blog. To be honest, I wasn't sure I would ever return to blogging here. When I last posted, our family was still adjusting to Ethan's diabetes. Now it's just part of life. It can take over at times, but our management skills are much better now! I realized last year that, apart from knitting, I had put my creative life on hold and I was really feeling stifled. Granted, I also had a toddler at that point, so there wasn't a lot of spare time for creative pursuits. But I realized that it was time to start doing something to nourish my creative side again. 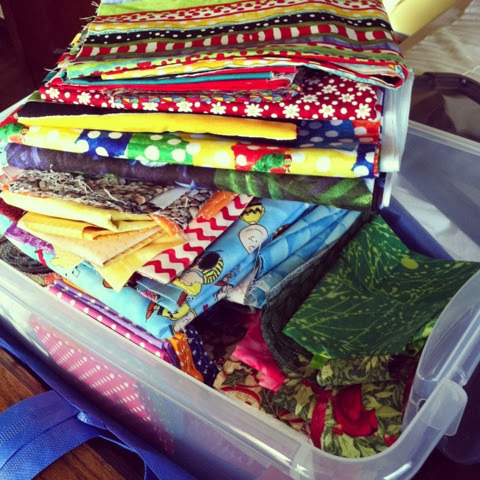 Cue the Return To Quilting! 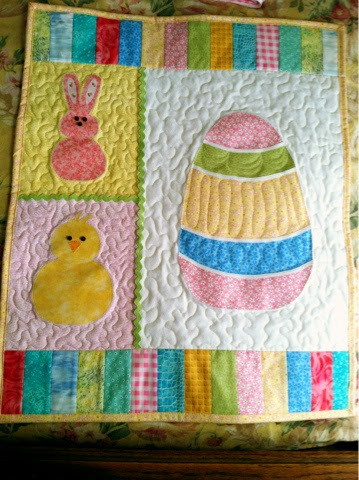 I took up quilting soon after getting married, but it got pushed aside when I had my first baby. I knew that if I took it up again, I wanted to find a way to give back...to bless others. My grandmother was an avid quilter and she and one of my aunts had been actively involved with Project Linus for many years. Grandma passed away in 2009 and I knew she would be thrilled if I got involved too. My Aunt Linda and her sister Becky got me set up with a hefty fabric stash and I haven't looked back! Ethan received a Project Linus blanket when he was diagnosed with diabetes, so I know the comfort those blankets can bring, as well as the joy that comes from making and giving one. So that's the scoop. I'm still knitting, just not quite as much as I used to. If anyone is still out there...thanks for sticking with me!